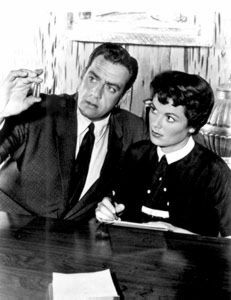 Perry Mason was my first television detective. (He was technically a lawyer, of course, but he always solved his own cases.) On the nights when my father was out of town, my mother would let us watch Perry Mason reruns as we ate our Noodles and Ground Beef Casserole. For years afterward, I associated Perry Mason with comfort food. Those were black & white days, of course. I don’t think the original series with Raymond Burr ever ventured into Technicolor. The episodes usually started out with some damsel in distress who was about to be arrested for a murder that she didn’t commit, and ended with a stirring speech by Perry Mason and a surprise witness that Perry’s associate Paul Drake would bring in at the very last minute. Each case was wrapped up all neat and tidy–and Perry would take Della Street’s arm as she laughingly replied to one of his witty bons mots and they would stride off to lunch with Paul Drake close on their heels, grinning because he always got the joke. The three of them were a tight little club, though I was always disappointed that Della didn’t get to do more exciting things. So often she had to stay in the office and hang around the phone. Perry was a take-charge kind of guy. He rarely faltered in his judgment of his client or the true culprits. His suits and ties were always neatly pressed and he never appeared out of breath. 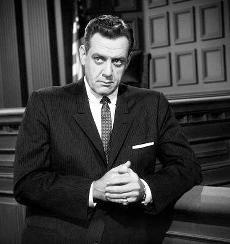 Perry Mason was solid, dependable and reassuring–just what every good lawyer should be. I liked that he was smart, too, and was able to unravel complicated mysteries. He set the standard very high for the television detectives who came later. 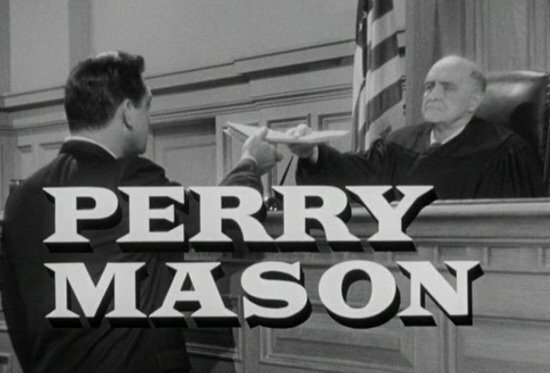 I wonder that so many courtroom dramas kept the Perry Mason mystery/courtroom formula for so long. Thanks to the magic of Uncle Ted Turner’s TCM channel, I finally got to see some of the early Perry Mason films from the thirties: The Case of the Velvet Claws and The Case of the Curious Bride. Like the series, the movies were based on the Erle Stanley Gardner novels, but the Perry Mason of those films (Warren Williams) was rather more debonair and adventurous than Raymond Burr’s Mason. He was almost like William Powell of The Thin Man films. Those early films made me think that I should probably dig out some of Gardner’s novels. Wikipedia says that Raymond Burr was involved in twenty-two of the twenty-five Perry Mason revival films that were made beginning in the 1980s. I watch them when they’re on, though they got a little sad toward the end of the run. Still, they are like comfort food. Nothing can beat the Perry Mason theme, though! What is Perry thinking when he stands at the courtroom railing?